Edit: Mac Game Store, too! This game is the Bomb! I'd say the best MGS game since the first two ones. Though it's an ultrafast hack n slash game that has absolutely no time for stealth. What I like is it's the first cider wrapped game that I've noticed has full multichannel surround sound so I get full positional 5.1 surround sound out of it. On the other hand it's not perfect as in-game dialog tends to get routed to the front left and right when it should be in the center which is something that happens to one degree or another with quite a few games.... and only some games have gotten it right (such as the native version of Batman Arkham Asylum, City.. most recent LEGO games and Alan Wake in Wine). Most other sounds get specialized correctly including in-game comm chatter and the characters own voice during non-cinematic in-game scenes. But either way I'm happy that cider now supports it and hell yeah the game is fast. Except theres a bit of slowdown if I turn on MSAA. I tried using FXAA injection dll's like I did with the leaked beta but they didn't work with the final. FXAA Tool caused z-order bugs with the models and SweetFX caused the game to crash. Not in-game no as far as I can see. Unless you have a utility that can force it from the outside. Like the drive control panel which doesn't exist on the Mac. I just played a little... wow! Amazingly fluid! Switching to my screen's native 1680x1050 caused an offset anomaly but that was rectified by a restart. Detected and works flawlessly with my PS3 DualShock. Edit: I noticed reference to the Havok Engine being used and remembering that setting it to utilize all available, actual CPU cores really bumped up performance in BioShock but can't find any config files that have reference to a setting therein and can't find anything online. METAL GEAR RISING REVENGEANCE is region locked in Japan. Odd. I checked out the package contents and it appears to have been localized for Japanese (contains a Japanese.lproj directory). Can you open the Info.plist and change <string>English</string> to <string>Japanese</string> to see if that works or could you simply not purchase/install it? Yes, frakking Konami, they have their heads full of Sh*t big time!!! MGR is the first title that incorporated "cross-country gifting restrictions" a new Steam feature. That means even if you buy it from another site, you cannot activate it with a Japanese account. And since you also cannot buy it in Japan you are completely locked out. but can do so when I am in Germany. At least I can play it from my German account when I am in Japan. This is annoying to read. Would you consider contacting Konami or Steam to inquire further? I don't even see MGR on the list of PC games on Konami's Japanese site. It's on Amazon (PC version) but it does include a "U.S. only" note. Must be a conspiracy to keep Japanese gamers off of western platforms. PC Games of many Japanese publishers are region-locked in Japanese Steam Store. Probably, they want to sell CS Games to Japanese people. Yeah, basically Japan is a Console country. It has to do with CERO, the japanese Version of ESRB/ PEGI. Most Japanese Publishers just don't care to resubmit their Console ports to get the PC Version approved in Japan. Something like this, I read somewhere. I could however buy lots of Jap. titles from other sites and activate them in my Jap. account, no problem with that. At least until MSR:R.
Now all they need to do is make a cider version of silent hill 2. I'd love to play something that is close to a native port and isn't as buggy as the HD rerelease on consoles. Unless they fix the bugs the PC version has a cider version wouldn't have less bugs. These days I've seen that PCSX2 with SweetFX modding actually gives better results than playing the PC version (SweetFX can apply better film grain than the built in grain function since it's higher res for example). It's possible to use a DX8 to DX9 converter with the PC version and then sweetfx on top of that but generally speaking the PC version has problems with the cut scenes and sound with multicore systems... which isn't easily worked around on Mac. If Transgaming would do that job then more power to them! Especially if they enable the "3D sound" options (up to 7.1 channels) the game supports. Don't have SH2 installed right now so I'd have to reinstall it with an unofficial wrapper and give that a try. (I'd run that and see if I can get SweetFX going and that one person's profile for SH2). 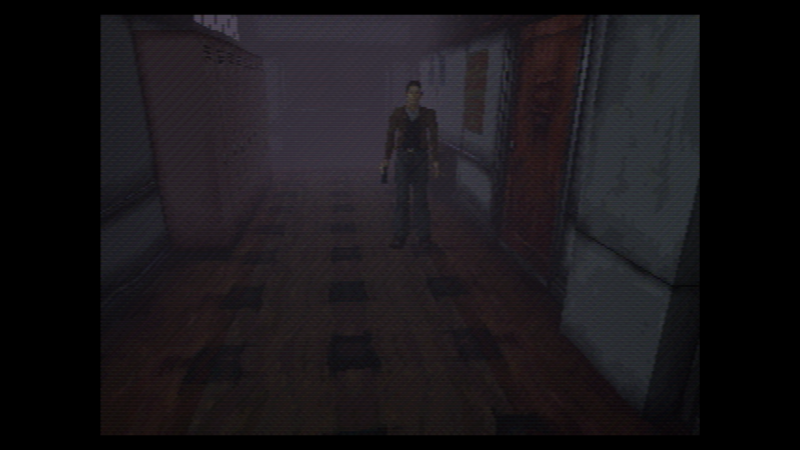 As for me right now the SH I've been playing is SH1 in OpenEMU with NTSC filter applied. It's a lot more primitive than SH2 of course but to date I actually never got around to completing it. I mean look.. Welcome to the 90's. Still I'm having the nostalgia feels. 3) Gets picked up for porting to Mac. You'll have to forgive them, their head of digital publishing was a Japanese holdout and thinks the war is still on. I was testing Silent Hill 2 PC with a fixed .exe in Wineskin with the ENB Series DX8 to 9 converter and SweetFX but it has an unhandled exception with the DX8 to 9 wrapper. On the other hand.. the log file for SweetFX claims success..
BTW, Transgaming told me that they where working on getting 3D Sound with dsound working in Cider so if they made a SH2 port it may end up having that which would be great. Mainstream Wine has had it disabled for dsound for a while now and the last dsound game I played with multichannel was Dead Space on an older Wine engine. Considering how sound effect work on silent hill 1 sounds very primitive compared to silent hill 2. Even compared to other playstation 1 games. Still though, silent hill 2 looks better than homecoming and downpour. I guess part of it has to do with team silent having a better understanding of designing lifelike characters compared to the other developers outside of konami's internal studios. It was almost like the double helix and etc deliberately made the characters look low poly or like poorly made clay figurines. I was just playing some SH2 in Wineskin and it's remarkable how big a leap it is from SH1 in every conceivable way. From the graphics to the controls.. I noticed SH1 had some analog thumbstick support but it was nowhere nearly as robust and smooth as the support in SH2! Then transgaming (if they are the ones to port it) can enable 3D sound for dsound or Konami could update the game to use the same sound API that games like Alan Wake use (most likely xact or xaudio)... Then it would be perfect. Also it could use a frame rate limiter because it's turning my Mac into a wind tunnel like Tomb Rader (2013) does even though it's not a demanding game by now. Also even with the fixed .exe some of the in-engine cut scenes aren't playing and I have to skip them.. unfortunately. As long as they used the source code from that game verses the code base for HD Revelations. It's still a trip how there isn't really a huge difference in the graphics department comparing the PS2, Xbox, and PC versions. I guess it was team silent doing what they could at the time to get the most out of the ps2s limited hardware and it's GPU only containing 4 mb of vram.